Sudden current or voltage changes are often hazardous to electronic products. For example, transients or surges that reach microprocessor or memory components can destroy those expensive parts, and wipe out critical programming and data. Many electronic products now include surge protection circuits. In these circuits, low value resistors sense when the current is too high so that measures can be taken upstream before the excess current causes damage. Wirewound resistors are a popular choice for these applications. They are inexpensive, available in low resistance values, have low temperature coefficients and good surge-handling capability. Riedon has served this application for years with their "LO OHM" power resistors. Now, Riedon's new SL resistors add an additional application advantage. We designed them for PC board surface mounting to satisfy the growing demand for new high density boards fabricated with automated pick-and-place equipment. SL resistors use an alloy strip resistance element, the best design for resistance values as low as 0.005 ohms. The strip element has extremely small inductance. This feature is important where circuits involve very fast rise times; transients, or "spikes," are common in current-sensing applications. SL resistors are also more robust. They have only three components: the resistance strip and two leads. We weld the leads to the strip, and mold the assembly in high- temperature epoxy. Power supplies are a major application for current sensing resistors. Space-saving surface-mount designs are especially popular in small supplies, miniature DC-to-DC converters, small battery charging circuits, switching power supplies, and uninteruptible power systems. Surge-resistor networks are important in telecommunication applications to detect voltage surges on telephone lines. Other applications include computers and peripherals, disk drives, microprocessor-based controls, instrumentation, medical equipment, metering devices, and ballasts. Some other low resistance resistor designs use thick and thin film technologies. Thick-film products are inferior because conductive inks are not stable. Thin-films offer low resistance, but the temperature coefficient is higher. Neither offers good surge-handling capability. 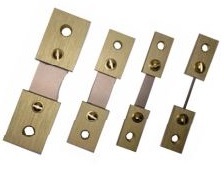 With wirewound or strip elements, you get the best stability and lowest temperature coefficient. With strip elements, you also get very low inductance and good response to fast rise-time transients. Strip and wirewound designs are known for their good surge-handling capability, an obvious requirement in these applications. You get all these features at a low cost with Riedon's SL Series resistors.